We’re a few weeks away from Nantes where Chris and I will be attending the EPSC-DPS meeting to present results from Planet Hunters (and for me I’ll present a poster on my KBO work as well). Our talk will be on October 4th. We’ve been working hard to get results for Nantes, and we’re asking for your help. We are looking for volunteers to help screen the Q1 light curves a second time to make a final list of transit candidates. We’ve narrowed the list of potential light curves down, and we need your help identifying which of those have two or more transits. If you’d like to join in, go to http://review.planethunters.org. 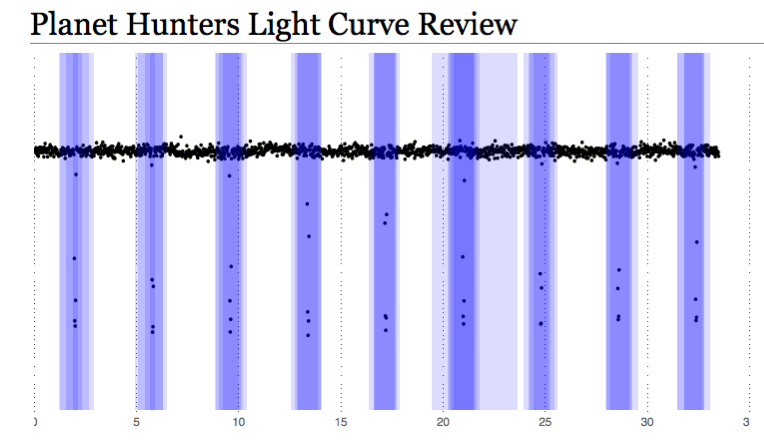 On the review site, you’ll see for each light curve the plotted transit boxes made by the zooites who reviewed the light curve (in blue) to guide your eye. You’ll be asked to determine if there are at least two transits in the light curve based on the what’s flagged inside the transit boxes and what you see in the light curve. The review site works differently than the Planet Hunters interface, so please do check out the introduction and help material. Is there any change you improve this page? I think that I will be really useful if you add the bottom slider for this part as well. Sometimes it is quite difficult to say whether we deal with transit or not, because the image is too small. So does this mean that we have all the Q1 light curves done? Hy Meg ! Hy everybody around our little world ! What a nice idea to make us seeing thoses curves, sometimes so beautifull … and our work is usefull, isn’t it ?. What a pity to have to go to sleep … for working on tomorrow. Thanks for the feedback. Unfortunately right now it’s not possible to add the zoom feature. But for most light curves I think we’ll be okay without the zoom. There are more and more “Yes” answers for the question on review ; have you got a program which is making a filter from our answers to keep only “yes” answers ? There are so many worlds where a planet (or more) is very quickly turning around her host star ! So wonderfull … it’s like if I could see those worlds through the window of my PC. Is there any target goal to the amount of reviews per light curve, or is it more freelance and see what happens? I didn’t thought that I could ever see so many hot Neptune and hot Jupiter ; when I think that Kepler is looking at 150000 suns lights, I ask myself how many curves with those exoplanets are existing under my open eyes. Tastiger – it’s currently at least 5 looks per light curve (if we can get more than that would be great, but depends on how fast we get through these 7000 lcs), and for those with a lot of maybe votes, they might get put through to get another few classifications (but not sure of that). I’m having some difficulties with this, every seven or so times I review a curve I get one where I can only see the blue bars and not the light curve. Pressing update doesn’t change anything, and reopening the page brings up the exact same light curve. The problem happens across browsers. I’m using a macbook pro, running OS X 10.5. So far I click ‘Maybe’ whenever that happens. Any advice? i think that’s the case. we’re working on fixing those curves. And there are still some sims and Q1 data running on the PH site, I will try and process those classifications and add them in, and since the response has been overwhelming – which is awesome – we’re going to push to 10 looks – we wanted at least 5 – hopefully all these changes will be implemented tomorrow.